I finished my first sprint triathlon on June 1 and it was actually great! The Wednesday before the race, Savannah was kind enough to meet me to do an open water swim. When we first got in the water, I definitely freaked out a little bit, but Savannah stuck right next to me and I got through it after about 20 strokes. We practiced sighting a little bit and she tried to help me learn to breathe on the right, but it was a little difficult for me. Apparently in most triathlons buoys are on the right, but we figured we would practice this more later. We then went over some tips on transition and what I needed to bring on race day. I left feeling much more confident about being able to accomplish the race on Saturday. I really don’t believe that the race would have gone so smoothly if Savannah had not been sweet enough to meet me. Race day I got up around 5:00 to make sure I could get to Blalock lakes by 6:30. The drive was super easy and I got there much sooner than expected. I quickly got my bike and everything set up in transition. When I got there I looked out to the lake and they were putting the buoys out. I was amazed at how close they were! I truly was expecting the swim to feel very far out. And to my surprise it was a counterclockwise swim so all of the buoys were on the left! It was almost like this race was meant for me! Start time for the first group was at 8 am. I started with the novice, aqua bike, and relay swimmers at about 8:21. I was very nervous so I stood behind all of the other swimmers at the start. I quickly realized that was a mistake. I had to stop multiple times to let people get ahead and move to the left to keep from running into people. I finally got through and got into a good rhythm. I had in my head that I was going to look for the buoys every 5-10 strokes, but I didn’t because I didn’t like how it took me out of my rhythm. Because of that I swam out of the way a few times and had to swim back. I will not make that mistake next time. I made it out of the water in 16:05. Almost 3 minutes faster than I expected! Transition was really close and easy and I got in and out of there in 1:08. My heart rate was really high coming up from the swim and I had a hard time getting it under control on the bike, but I pushed through it as best I could in the bike portion. The ride was very hilly, but I had biked lots of hills around my house so I felt prepared for them. I was able to pass quite a few people and it fueled my desire to push faster. Eating and drinking on the bike was so hard! I need to practice that more. I finished the 14.7 mile bike in 52:12. Transition was easy here too and I got in and out in 1:04. The first mile of the run felt really hard. I don’t know how fast I was going, but it really didn’t feel like I was going faster than 9:30-10 min/mile. After the first mile it (finally!) occurred to me that I should practice controlling my breathing (3 in, 2 out) and once I did that I got my breathing under control and was able to pick up the pace. I finished the 5k in 26:22. Slower than I was hoping for, BUT, I finished the race in 1:36:54. 8+ minutes faster than I anticipated!!! To top it all off, I ended up getting 2nd in the novice category. It was pretty amazing. Next I’m doing the duathalon at Blalock lakes on June 22. I feel very ill prepared for this one because I haven’t given myself (or my coach Savannah) enough preparation time for this race. It’s a 5k, 24 mile bike, and a 10k. It’s going to be much hotter and much tougher. After I get through this, though, I’ll be well prepared for the tanner park intermediate distance! Time to wake up! Its race day and in a few short hours I will be racing at Blalock Lakes in Newnan, GA. I really have no expectations from the race other than I know the course will be hilly and I am not fond of hills. I don’t know about y’all but when I hear hills, it strikes some uneasiness into my gut, my legs get weak, and I know that it’s going to be a long day. I don’t know why but it just does. My week of training has been decent but I have been training for longer distances so transitioning to sprint distances, is a very big shift not only in the mental but the physical endurance. There is no more long and strong; it will be short and fast; real fast, if I am lucky. Sitting out in front of the gate at Blalock Lakes and begin to mentally prepare for the race and going over the bike and run maps in my mind. I know where the climbs are going to be but like I said earlier, this is a sprint and not a half or full Iron distance so I am going to need to push it pretty good but still saving something for the road. Bike is in transition area now and I’m listening to Eminem’s “Till I Collapse”. It reminds me that my mind can go further than my body so get that in the right state first and then my body will follow (hopefully). All my shoes, helmet, sunglasses, socks are now in place for T1 so let’s get on a warm-up run. Wow, this place is hilly. Warm-up swim. Water feels good- not too warm, not too cool- concentrating on good, strong hip turn, and good cadence with my arms. Thankfully this has one of the shortest distances from water to bike that I have ever experienced. Socks, shoes, and helmet on and we’re off on the bike. Going out, hills. Settling into race pace, and I feel good. Race officials come along side to make sure I am keeping my distance so I smile and say thanks for keeping us safe! Middle part- hills. During this part of the race, I begin to not think about the race, but about how Blessed I am to be racing! We have a gorgeous day, a dry road and a lot of great athletes to race against. Last bit – downhill. Gotta love this part. Rounding the corner into the park and nothing but downhill. Change shoes, bib # on, and I am off. Man, my calves are a little tight. I hope I don’t cramp up. Did that Smith kid just pass me on his way in?!!! Wow he was fast! Ok, focus now. The first part of the run was not good. I just didn’t feel good. In the turnaround and half way home now. I begin to pick up the pace knowing its only 1.55 miles from the finish. My calves are ok now and I see my pace getting closer to where I need it to be. I hit the finish and record a time of 1:22:47.5 (11:53 on the swim, 43:55 on the bike, and 25:00 on the run). Not bad but I know I have a lot of work ahead of me. I have a two mile critical velocity test, and I look at the schedule of my workouts and see a drastic difference b/w what I did on my own vs. what I am doing with Coach Mariska and Team EC. On my own, I would go out on a swim, bike, or run and do it to get it done. Now, I have specific drills that will test my endurance, work on technique, and reinforce good form vs. just mileage. As a former coach myself, I can see how these drills are the building blocks to my improvement. The drills are definitely more intense than my former workouts but then again, the focus was very different; nonetheless, these drills can begin to change not only the physicality but also the mentality at which I perceive and execute my workouts. This will in turn get me faster and better as a triathlete. My next race is July 20th at Mistletoe State Park, and knowing that I have 7 weeks of these kinds of workouts, I am very excited to see how much I will progress. As coaches, there are several methods we can use to get the most out of our athletes. I have found that when an athlete begins they are only concerned about how fast they can get, not how to get fast. Each athlete is motivated by different things and it’s our job to tease that out. The first question that is inevitably asked of an athlete is, “What are you goals”. The standard answers of to get faster, stronger, etc are too nebulous in nature to truly use. It is the job of the coach to transform those into concrete targets. There are two ways this can be done. While they tend to be mutually exclusive, they can be used in conjunction with each other to provide a path for the athlete. To start, you have to establish what motivates your athlete and devise whether a goal or process oriented approach will work best. To help you determine which approach is best, I have defined each below. Let’s start with Goal-Oriented. Goal-oriented training is best for long range goals that can be expensive in nature and have many facets to it. Multi-year plans culminating in qualifying for Kona is an example. The athlete has a target goal and that guides the path. This goal does not have to be a race. It can be small goals that build upon each other and result in a larger goal. The path is not set but the end result is. Note that these goals are very individualized and concrete in nature. Goals need to be time-limited. There has to be a deadline. You just can’t let the goal go on for years and years. Having a deadline creates a sense of urgency for the goal and a sense of responsibility to get after it and get it done. An example of a short term goal would be to go sub 40 in a 10K. There are many paths there; it’s up to the coach to determine which path to take. Process-oriented training reflects activities that occur in the process of achieving the long term goal. With process oriented goals, the exact outcome is less controllable and may be affected by factors beyond your control. These goals are more “squishy” like I want to improve my 10K speed. The athlete’s focus is on what they are doing instead of what it will get them. It requires trust on the athlete’s part that the process will get them there. It’s important to get the athlete to enjoy the challenge of the training and the goal will take care of itself. Organized goal setting with the use of short term process goals that lead to a few relatively large controllable long term outcome goals improves your performance and assists in creating optimism and motivation for the process. Basically, you focus on the building blocks and motivate them through each one. Unlike running or swimming, there are no set time standards that will qualify you for a World Championship or the Olympic Trials in Triathlon. Mostly triathletes race against each other and the clock. This varies greatly over differing terrain, temperature variances and the unpredictability of who shows up on race day. While it’s nice to have fast times, a 5 hour time in St. Croix requires a different effort than the same time at Eagleman. It’s vital for a coach to alter time goals to each specific race. If the athlete is truly set on establishing a goal time, then pick a race that will allow them the best opportunity to accomplish that. Most athletes have to enjoy the process in order to continue progressing and putting forth an appropriate effort. While we all like to think of ourselves as 1%ers; the fact is that 99% of us are in the sport for the fun and health benefits of it. Our achievement is to push our bodies and see what the clock reads when we are done. In the meantime, it has to remain fun. That does not mean that all workouts are going to be fun, but when you’re done training for the day and your athlete looks back over the week, it should still be fun. Next time your athlete says, “I want to get on the podium”, ask them how they want to get there. Make them be part of the process of training that will allow you to get them there. Tell them the following: “We are in a sport with many variables. The only variable you can control is yourself. This is why process-oriented training is best for triathletes. Focus on what you are doing and which you cannot control will take care of itself.” Use both methods to get the most out of your athletes. Start off with something as small as make one morning swim session this week. Then use a goal of a specific T-pace. Eventually you have them build up to an IM swim. The fourth of July is great for a lot of things. Eating awesome foods is probably my favorite. While relaxing with some of my best running buds they introduced me to one of their secret weapons to satisfying their sweet tooth. Their food of choice? 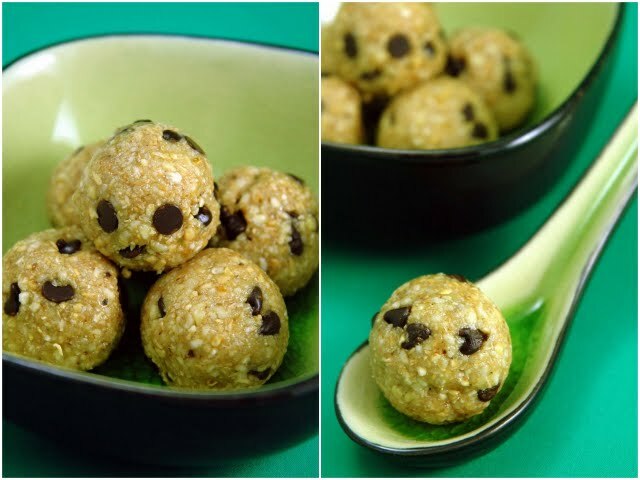 Oatmeal based cookie dough bites. Because their base is oats, walnuts, almonds, and agave nectar, you get plenty of protein and healthy fats. It’s a great mid day snack or something to grab after a workout! Here’s the recipe! For additional nutrient value add Flax. That’s an addition my runner friends made and they were just as delicious! I will credit their find to Pinterest and ultimately to adashofcompassion.com. Original article link below. In a food processor, process the almonds, walnuts, oats, cinnamon and salt to a fine meal. Add the agave nectar and vanilla and process to combine. Next, add the cocoa nibs (or chocolate chips) and pulse just to combine. Roll the cookie dough into balls (about 1 tbsp each) and place them on a cookie pan lined with parchment paper. Place the pan in the freezer for about an hour to firm up. Store balls in a tightly covered container in the freezer. Raw oat flakes can be substituted for regular rolled oats (or certified gluten-free oats, if necessary), but if you want this treat to be truly raw, look for raw oat flakes, which haven’t been steamed or toasted during processing. Hiring a coach isn’t for everyone in our sport. Some people go around reading and researching everything they can about the tried and true ways to train. Some are coaches themselves, and can make their own training plans without being biased about their sessions. Others use triathlon just as a outlet, a hobby, and can’t warrant the cost of hiring a coach. But for those of us that have a coach, we need a good fit. One thing I looked for before hiring my coach, Tony Hammett at Endurance Concepts, is a coaching firm that invests in their athletes. I’m talking a company who’s athletes aren’t just pay checks; they actually want their athletes to improve. And they want to really know you, more than just logging your hours each week. Knowing what you want from the sport, life, where you are mentally each day, ect ect. The relationship should be more than just athlete-coach, and that will translate to bigger and better results. I’m not writing this to dote on my coach, but more to show how a coach should interact with their athletes. During my flat[s] debacle in Cartersville a couple of weeks ago, Tony asked me a question while Bethany, Tony, and I sat on the side of the road. I immediately threw out an answer, to which he just nodded and kind of grinned. I read people well, so I knew there was something else going through his head, but I didn’t know what. I thought it was a good answer. About 36hours later I sent Tony and email, with my real answer. His response was basically “I know” but in more words and with an explanation of how he knew what my answer would be. He knew me better than I knew myself, and it’s because of that that my training fits so perfectly, and that I trust his guidance.